Spend seven days and six nights traveling in the Golden Ring of Russia. This tour spends all of it's time in the Golden Ring of Russia. It begins with our initial meeting in Moscow and sets out at once to Vladimir, one of the Golden Ring's oldest cities. The "Golden Ring" is the name of a tourist route popular with both Russian and foreign lovers of old Russian architecture. We meet in Moscow on the first day and immediately begin our tour of the Golden ring of Russia by setting off by road to Vladimir. On the way we will pass through villages that seem to reflect a style of life reminiscent of a hundred years ago. Vladimir predates Moscow as a center of Russian power. The afternoon will include a general tour of Vladimir and Suzdal. This will include two cathedrals and the "Golden Gates". You will also visit the museum of Crystals and Lacquer Miniatures. Accommodation in Vladimir ("The Gold ring ") or in Suzdal ("Projection") and dinner. Today is spent in the beautiful old town of Suzdal. We tour the Kremlin and the Museum of Wooden architecture. This outdoors exhibition covers several acres and contains many fine examples of traditional Russian wooden building styles of both houses and churches. This "log cabin" style of construction typically uses no nails. Suzdal is also a famous center for the making of Russian church bells. You will be able to attend a "bell concert" in the Saviour-Efimiev monastery. Dinner in Suzdal. We begin the day with a visit to the monastery Beloved of God Following a tour of the monastery we set of for Kostroma. Situated at the meeting of three rivers, the Kostroma, the Debre and the Volga, Kostroma is a jewel. The oldest building in the town is the cathedral of the Monastery of Epiphany and was built in 1565. Accommodation in hotel " Volga "and dinner. Following breakfast will be a sightseeing excursion of Kostroma The pride of Kostroma is the museum at the former Ipatyevsky Monastery which played a part in almost every important event of the town's history. Transfer to Yaroslavl, accommodation In hotel " Anniversary ", dinner. Breakfast and sightseeing in Yaroslavl. Yaroslavl is located high on the bank of the Volga river. The sightseeing tour will include Savior-Transfiguration monastery and Museum “Music and Times”. We next travel to Uglich, During the period of 1219 through 1521, Uglich was the capital of a small feudal dukedom. Uglich is famous for Russia's darkest secret: the death of Prince Dimitry, son of Ivan the Terrible. Accommodation in the hotel " Uspenskaya ", dinner. Accommodation in hotel " Pereslavl ", dinner. After breakfast today we set out to Alexandrov. Sightseeing and a visit to the "Architectural Ensemble of the Large village" and 2 dramatized representations ("Courtship" and " On small imperial reception "). We depart Alexandrov for Sergiev Posad. The tomb of the famous Boris Gudonov is here. 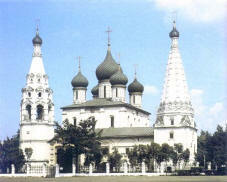 Sergiev Posad is sometimes called "The Russian Vatican". Here, in Trinity Cathedral, is kept the famous Andrew Rublev's icon - "The Trinity", which was created specially for this cathedral. .Return to Moscow. Accommodation is on the tour is arranged according to season and availability. We guarantee clean, secure and functional facilities - Improved Tourist Class hotels. If you have a special interest please let us know so that we can make advance arrangements. The host for your tour will be flexible with the schedule to get the most out of weather fluctuations and special interests. Museum tickets are included. The tour includes 6 breakfasts + 6 dinners.